Volusion is a website builder that may be used to get an eCommerce store up and running. The resource offers lots of features and tools that contribute to the success of the webs building process. Let’s have a look at some samples of online stores created with Volusion to get the idea of how it works. All the gourmets and cheese fans will be excited to pay a visit to Antonellischeese.com – the web store offering an amazing variety of cheese sorts to come up to any taste and occasion! 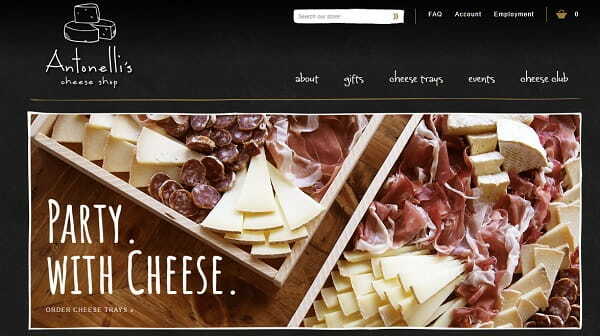 The website design is catchy and so tempting, with all those high res photos of cheese trays! The website menu is convenient and easy to browse. Found at the top of the home page, it comes with drop-down windows that provide access to various website pages and sections. Having signed up for an account, you can browse the assortment of products and place your order. You can also join the Cheese Club, book an event, sign up for a cheese class or even become a wholesale partner! Options are numerous, so, hurry up to make your choice! 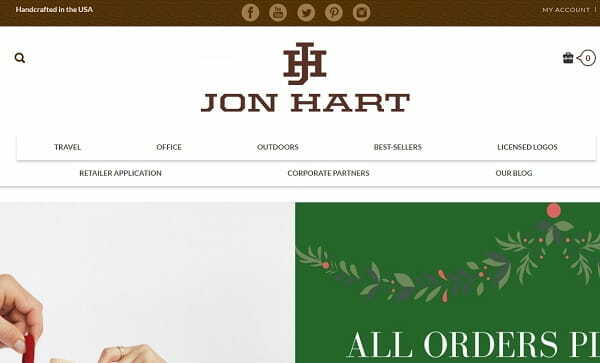 Jonhartdesign.com is the US-based eCommerce website of handcrafted, custom monogrammed bags and gifts. Website design is stylish, contemporary and it completely comes up to its major specialization. Visitors cannot but notice full-sized images of items offered for sale here. It is possible to place an order either by reaching one of the menu points or by viewing the collections as you scroll down the homepage. Two video presentations of the web store do not only notify the potential customers about its history, but also encourage them to purchase from the shop. Users, who wish to stay connected with the company and intend to be informed about the recent updates, can subscribe for the newsletter or sign up for the social network accounts. 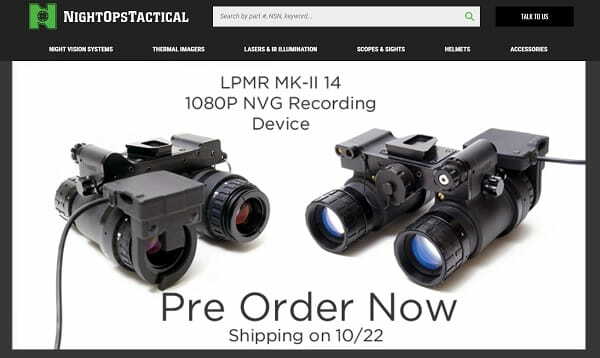 Nightopstactical.com is a web store of night vision equipment and gear. The company has over 18 years of experience, offering a broad range of high quality night vision products and accessories. They are available in numerous menu categories, including Night Vision Systems, Thermal Imagers, Lasers and IR Illumination, Scopes and Sights, Helmets, Accessories. Each menu section comes with drop-down categories providing detailed access to the product assortment. Each item has the detailed description, specifications and high quality original photos. This helps customers get an idea of how the products look and what their implication is. There are also quick links, granting access to the major website sections, products and customer support. Users can also search the required product by name, part, keyword and other parameters. The design of the website absolutely adheres to its topic, with product images and info being published against the dark-grey background. This is a worthy sample of the Volusion-powered web store! 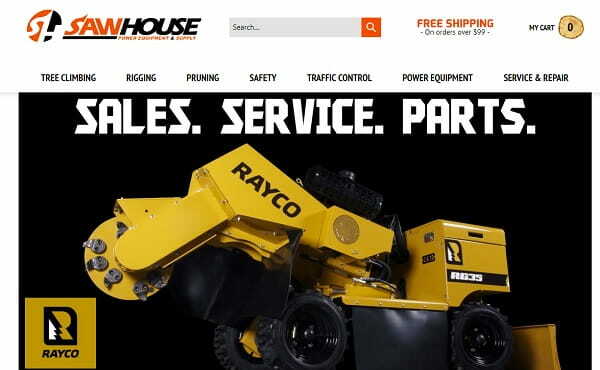 Sawhouse.com offers power equipment and supplies for businesses and individuals in the Houston TX metropolitan area. The web store has stylish design, which totally adheres to its niche specialization. The menu is available here on the top of the page, with many sub-menu categories for easy product search. These include Tree Climbing, Rigging, Pruning, Safety, Traffic Control, Power Equipment as well as Service and Repair. The same categories are available at the home page as you scroll down for easy and quick access. They come with distinct and high quality images, product descriptions and specifications, shopping info and videos about the featured products. In the home page footer, you will find the contacts info, access to the major website sections and account sign up category. It’s also possible to sign up for the web store newsletter to be aware of the recent updates and special offers. 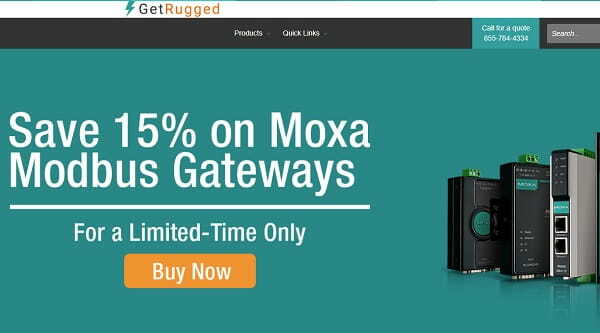 Getrugged.net is an online distributor of rugged networking and computer technologies. They provide a rich assortment of products, which are specially engineered for mission critical applications and can be operated in various environments and under different (sometimes even critical) conditions. Full-size image slider available at the home page presents the major information about the company and its featured products to notify customers about the place they have come to. The CTA button redirects to the web store, where everyone can place an order, having reviewed product specifications and shipping terms. Just sign up for an account and make the choice! Techiewarehouse.com offers a rich assortment of mobile accessories to meet any needs and preferences. The design of the website comes up to its theme and looks quite simple at first sight. Such simplicity does not compromise with functionality, which is far more important for customers. The online shop starts with a home page that offers the groups of accessories based on the brand of smartphones and tablets. It is also possible to browse through the categories of these products by using the catalogue found at the right panel of the site or the main menu. The latter is very detailed and rich. To simplify users’ search and save their shopping time, the developers of the site have incorporated the search filter option, which is also available at the home page. Nice job that will surely prove its value! 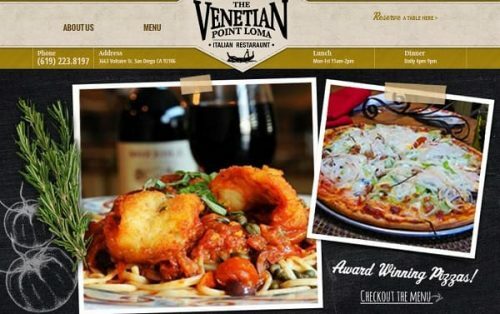 Venetian1965.com is a successful sample of a restaurant website, which comes up to expectations and preferences of any foodie. The only look at the site is enough to appreciate its design. The website is created in a comforting and soothing color palette with the focus on the services and special offers of the restaurant. There are only two pages here, but this is more than enough to make the clients interested and attract their attention. The home page involves a large slider, where a user may see what exactly a restaurant is ready to offer. There is also brief information about the restaurant itself as well as special services and offers they have. What differs this website from other suchlike resources is a feature that makes it possible to book a table online. This is very convenient and time saving. A great idea for busy people! 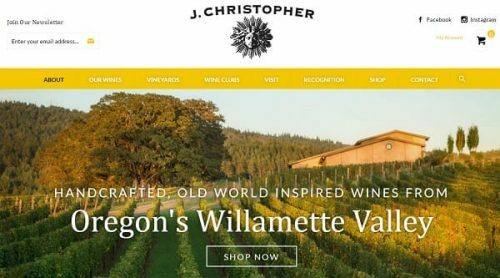 Jchristopherwines.com is a website of a small winery located on Chehalem Mountain in Oregon’s Northern Willamette Valley. The resource offers a rich assortment of quality wines that are handcrafted and sourced from the best vineyards in Oregon. The website impresses users with its exquisite design that makes it possible to feel the atmosphere of the vineyards and causes the desire to test the wines. The home page captivates the attention by a large and quality image of sun-lit vineyards. There is also the “Shop” button, which redirects a user to the store, where the best wines are offered for sale. The developers of the website have taken care about the convenience of customers by offering them the search filter and newsletter options, the social media buttons and the detailed contact info that comes with the Google Maps app to help detect the location of the winery. Nice job! Evutec.com is the place, where you can shop for trendy and high quality cases for mobile phones. The website was created with customers’ needs and searching convenience in mind, highlighting the benefits of the accessories they offer for sale. The design of a website looks modern and stylish, with a large slider that occupies the major part of the home page and high quality bright photos that display the benefits of the products. What differs this online shop from other resources of the same type is the availability of video reviews providing the most essential information about the products sold online. For all those customers willing to leave their comments at the site, there is the pop-up feedback window found to the left of the home page. As far as Euvtec has shops all over the world, the developers of the resource have made it possible to search for the nearest store using the Google Maps application. Shopping for a trendy accessory online is, however, more convenient and time saving and this is exactly what a shop is meant for. As you see, Volusion is a nice tool to build eCommerce websites of different complexity levels. The website builder involves the set of features and options that make the web building process engaging and help get functional and quality online stores up and running. The resource comes with over 100 features and a set of high quality eCommerce templates that can be customized with regard to the needs and objectives of users. If you have created an online store or a website with Volusion, you are welcome to share your experience with us!